AP&T has introduced a new destacker, the model DST-DH, that meets the automotive industry’s demand for increasingly rapid production speed. The destacker, which reportedly can work twice as quickly as a conventional destacker, is designed to feed blanks for large vehicle parts (A-Class) such as doors, ceilings and sides. • Blank washer and lubrication unit (optional). 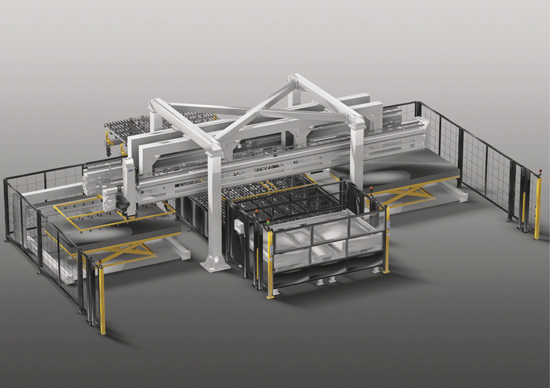 The destacker, based on AP&T’s standard modules, is equipped with double Gantry 200 feeders; picking is performed with the assistance of a vacuum. The centering tables utilize brushes to ensure scratch-free material handling. And, since the destacker is module-based, it can be scaled down for use in other applications and industries.